All of these organisms are very common in the environment and seem to cause disease only in individuals with some existing breakdown in the immune system. What are the symptoms of nasal Aspergillus infection in dogs? Nasal Aspergillosis infects primarily long-nosed (mesaticephalic) or medium-length-nosed (dolichocephalic) middle-aged dogs. Dogs with nasal Aspergillosis typically present with nasal discharge, bleeding from the nostril, sneezing and sometimes with de-pigmentation of the nose. These signs can also be indicative of nasal foreign bodies, nasal tumors or dental disease. It’s important to differentiate these possible causes with your veterinarian. How can you diagnose nasal Aspergillus infection in dogs? Diagnostic procedures begin with a history. 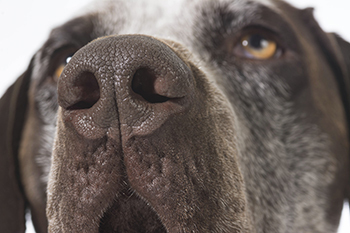 Age and breed are of particular importance since nasal tumors typically occur in older dogs. Radiographs, CT scans and MRIs of the nasal and frontal sinuses help rule out dental abscesses and tumors. They also indicate the degree of involvement and possible extension of the disease process into the skull. The best diagnostic tool available is rhinoscopy; the veterinarian will use a tool called a rhinoscope to inspect the nasal cavity. Running a culture (attempting to grow a suspected organism) isn’t of much use because Aspergullus can actually be a normal inhabitant of the sinuses. How can you treat nasal Aspergillus infection in dogs? The treatment of nasal Aspergillus is difficult and the prognosis with infection is very guarded. Unfortunately, oral antifungals are not very effective and surgery is of little value. The most successful treatment is usually topical antifungal drug infusions of oral liquids. The boney plate that separates the sinus cavity from the brain cavity should always be evaluated by CT before treatment is started. Otherwise the drugs could damage the brain by contacting it directly. Can Aspergillus be a wide spread infection (not localized in the nose)? 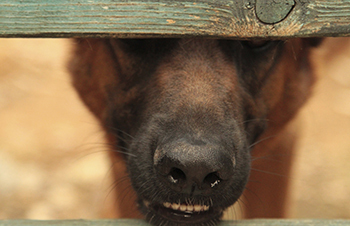 Aspergillosis spread is uncommon but reported more regularly in German Shepherds. Immunosuppression may play a role in predisposing a dog to such infections. Aspergillus can involve virtually any organ in the body. Diagnosis of the non-nasal strains is by a positive body fluid examination, a culture and possibly by a biopsy of the involved organs. Treatment of full body aspergillosis involves antifungals for extended periods and the prognosis is not generally favorable. While Aspergillus disease infects both humans and animals, it cannot be spread from person to person or between people and animals. Aspergillus is common and exposure is difficult to avoid but won't normally lead to infection.